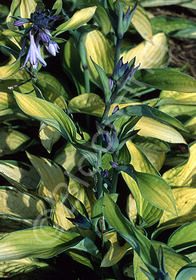 Dark green leaf margins surround centers that emerge light green then turn sunny-gold by summer. It grows and looks its best with some morning sun. Lavender flowers appear mid-season.